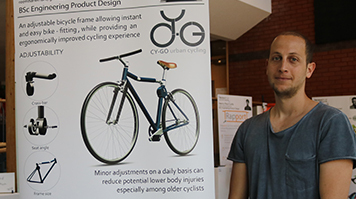 A bicycle designed to prevent repetitive strain injuries from cycling has been invented by a London South Bank University (LSBU) final-year Engineering Product Design student, with a patent now pending on the innovative solution. Re’em Haneman, who cycles from Highgate to the University daily, has been working on the CY-GO project since the beginning of the year and building his prototype since April. CY-GO differs from regular bikes by its adjustable frame – not just an adjustable seat and crossbar, but the frame size can be easily altered to suit people of different heights or to allow a different seated position when preferred. Re’em said he has loved cycling since he was a child and his experience as an everyday commuter inspired him to come up with a solution to help more people discover the benefits of cycling. “Cycling is very healthy and a recommended activity but at the same time many people use the wrong size bike frame or it’s not fitted to their body measurements,” Re’em explained. “I looked deeper into the bike fit problem and I came up with the idea of the ergonomic bicycle which allows the users to do minor adjustments or for many users to use the same bike, which does help reduce the risk of injury to the lower half of the body. “Initially the target market was elderly people because their bodies are much less adaptable. What happens when we are younger and using the wrong bike is our body adapts, but we’re actually damaging our body, impacting on our knees and our back, and we don’t feel it at this moment but in the future, we will feel it. The prototype has been tested to successfully meet all of the British standards for bicycles and was debuted at LSBU’s School of Engineering Product of South Bank degree show. The CY-GO will be on show next month at the New Designers exhibition at the Business Design Centre in Islington.